Scotland's Jamie Burnett is through to the World Snooker Championship after coming through qualifying. 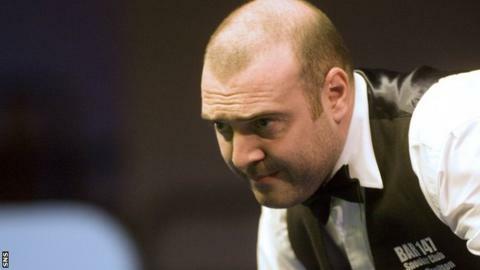 The 38-year-old defeated Englishman Ben Woollaston 10-8 to take his place at the Crucible in Sheffield. Burnett progressed through three qualifying rounds, having previously despatched Vinnie Calabrese and Cao Yupeng before meeting Woolaston. "I'm just glad to get through; it's the biggest tournament of the year," said the Scot afterwards. Burnett admitted frustration at his sporadic form but was delighted to seal his place at the Crucible. "I felt quite good and was hitting the ball well in patches," he said. "Then I went into little slumps and letting him back into the match. Ben struggled a bit and it was frustrating for both players. "You always want to play at the Crucible. "I would've rather played there a lot more times than that [this will be his fourth appearance] It's a tough tournament and I'm just glad to get through. I hope the draw's kind and I can stay away from Ronnie O'Sullivan and try to enjoy it." Former world champion Graeme Dott will miss this year's tournament after losing to Kyren Wilson in the final qualifying round. Fellow Scot Alan McManus caused a shock by beating two-time winner Mark Williams 10-8.